For her next feat of strength, modern-day folk hero Diana Nyad will swim for 48 hours straight in a giant tank outside of Macy’s at Herald Square in New York, surrounded by celebrities and bitter jellyfish that have journeyed all the way up from Florida to see Nyad fail (tentacles crossed that she won’t). The 48-hour continuous swim is part of a fundraiser called “Swim for Sandy,” which, you guessed it, will benefit the 25,000 residents of New York and New Jersey still displaced by last year’s hurricane. According to CBS, the event (scheduled for Tuesday) will raise funds for AmeriCares, a nonprofit global health and disaster relief organization, and the main event will be Nyad swimming continuously for 48 hours, every so often taunting one of the other celebrities (Ryan Lochte, Joe Manganiello, and Nikki Reed) to join her in the 82-degree tank. The estimated distance of Nyad’s swim is 96 miles, or, for those of you familiar with the hellscape along the Jersey Turnpike, the distance from New York to Philadelphia. 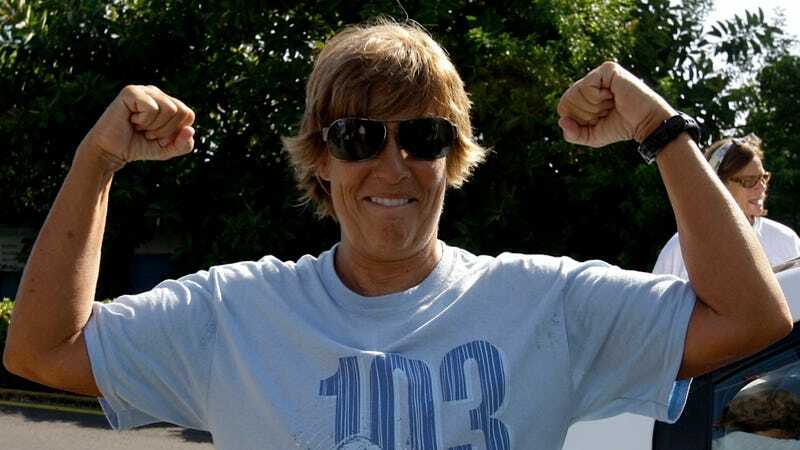 Nyad says she’s taking it all very seriously, but let’s be honest — 48 hours in a lukewarm tank is Diana Nyad’s version of a working vacation to Hershey Park.